You can also check out the interviews Briana has done in regards to her other works by clicking BOOK INTERVIEWS AND FEATURES and COSPLAY INTERVIEWS AND FEATURES. The Curvy Fashionista FEATURE: While the article is about cosplay, it also promoted the release of magnifiqueNOIR! Black Girls Create INTERVIEW: An interview I did about the book, cosplaying, and the importance of being a black girl creator! Pride.com INTERVIEW: An interview I did about the book and the importance of representation! Image Alley Digital DOUBLE INTERVIEW: Here are not one, but TWO interviews! The first is about my Hunters Series with my partner, and the second is all about magnifiqueNOIR! blerDCon 2017 DOCUMENTARY: The first ever blerDCon captured in a fun documentary features a lot of the art from magnifiqueNOIR! Ground Xero FEATURE: The cover reveal was featured on the blog of Xero Reynolds! Check it out! Black Girl Nerds PREVIEW: This preview went up before the Kickstarter was launched. Twin Cities Pride PODCAST: While my partner and I were at Gaylaxicon 2016, we were both interviewed by the Twin Cities Pride Podcast! We talked about our experience at the convention as well as our work which, of course, included magnifiqueNOIR. We talk a lot about the importance of representation. You can listen to us in the third episode of the Gaylaxicon coverage. 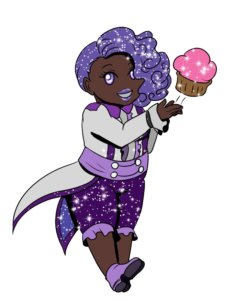 Self-Rescuing Princess Society INTERVIEW: This interview was done during the Kickstarter, but many of the questions are about my convention experiences, my life as a black, queer cosplayer, and how magnifiqueNOIR came to be. Afropunk FEATURE: This feature ran during the Indiegogo and it was a HUGE promotion for magnifiqueNOIR! If you’re interested in doing an interview, please send an email to brichibi@yahoo.com or brichibi@gmail.com.